Protect large area outdoors, or in a well-ventilated area. Prepare coffin for painting by making sure the surface is clean, dull, and dry. 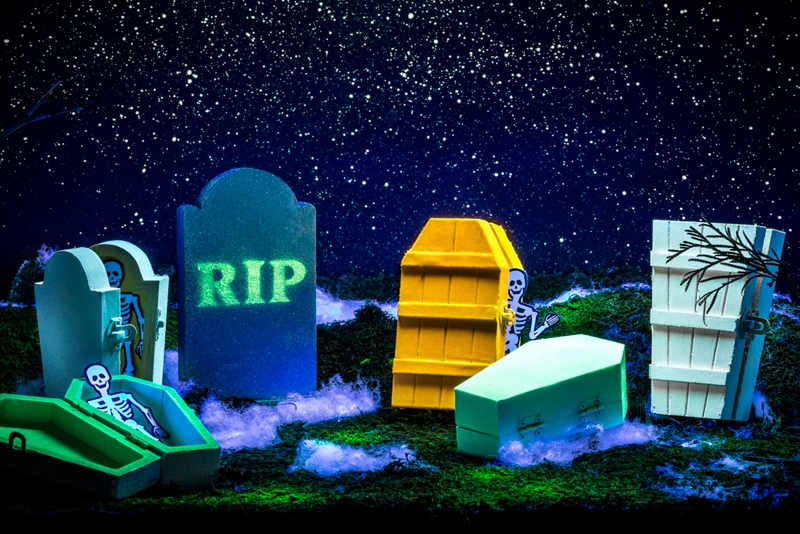 After reading can label for proper application and safety instructions, spray coffins in a sweaping motion using Krylon® Glowz Glow-In-The-Dark Paint in White, Orange, and Green. For best results, apply several lights coats, waiting one minute between each coat. Allow 15 minutes to dry to the touch, or one hour prior to handling. The surface will begin to glow after several light coats with exposure to light. Adding more paint will not increase the glowing effect. Prepare headstone for painting by making sure the surface is clean, dull, and dry. After reading can label for proper application and safety instructions, spray headstones using Krylon® Fine Stone Textured Finish in Granite, in sweeping motions. For best results, hold can 10 to 12 inches away from surface, and apply multiple thin coats to avoid runs and drips. Allow 15 minutes to dry to the touch, or 24 hours prior to handling. Once dry, position stencil letters on headstone and cover any exposed surfaces. In sweeping motions, apply Krylon Glowz in Green. Allow one hour to dry.